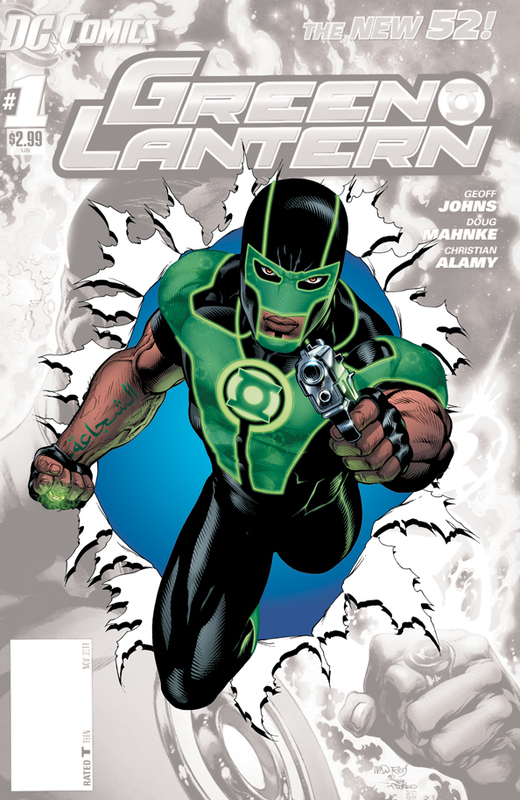 Remember the mysterious Green Lantern from the free comic book day issue of Justice League? no? See above! Now DC Comics has released the solicits for September and we get a good look at the New Green Lantern, seemingly black Superhero….and Muslim? An Arabic connection may exist since his tattoo reads “courage” in arabic. Who is he? Stay tuned as we unlock the secrets of this new Black Superhero! The introduction and origin of a surprising new Green Lantern! Where are Hal Jordan and Sinestro? Static Shock and Mister Terrific Cancelled!?! what the hell is with the gun????? I don’t care if he’s black, I want static and terrific back and we don’t need any more green lanterans maybe we should have blue lanteran on earth don’t care what races he/she is. We need a female lantern. He’s Arabic from the middle east. He was created in response to an outcry that Geoff Johns received when an Arabic character was killed within eight pages of Aquaman #7. Since Johns writes GL as well, he figured “why not create an Arabic GL to quiet that man”. If thats the true reason he came about, its gonna be hard for me to give the character a chance. I’m with yall though, I want terrific and static back but with writers and artists who care. It seems like they were destined to be cut. Im still buying Batwing wonder how long he got left.